MESS1802, and you wouldn't be better off fetching the other half of Urborg, Tomb of Yawgmoth + Cabal Coffers / Cabal Stronghold , Nykthos, Shrine to Nyx , Crypt of Agadeem , Gaea's Cradle , Serra's Sanctum , Urza's Tower and friends, Lake of the Dead , or any number of utility lands? I like Undying Evil for this kind of deck. Does great things with Gary, Tree of Perdition, etc. 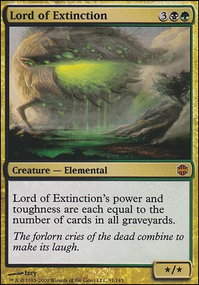 Also, since you can sac at instant speed, Mesmeric Fiend permanently exiles, since you can sac it in response to the ETB trigger, making it better than Kitesail Freebooter and other newer cards that have been worded to avoid that interaction. I agree that Grave Pact is a must-have. Some more ramp and card draw wouldn't hurt. I'm partial to Jet Medallion , Charcoal Diamond , Mind Stone , and Thought Vessel for rocks, and Syphon Mind is my favorite mono-black draw spell. 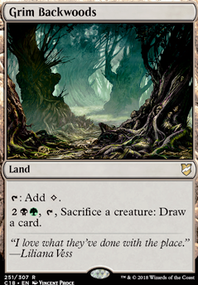 I would cut Ritual of Soot, since it scales very poorly in EDH. Crux of Fate , Damnation (if you've got the cash), Decree of Pain , Toxic Deluge , take your pick. 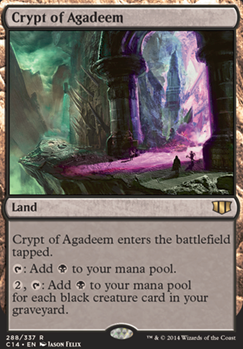 As for lands, Crypt of Agadeem would be good here. Phyrexian Tower just got reprinted. It's a bit pricey, but it is VERY good, and having been $60 just a few months ago with no likely reprint in the near future, pick it up now. Temple of the False God is a bad card, full stop. It is never correct to include it. Ever. That's not just me talking, but virtually every EDH content creator out there. 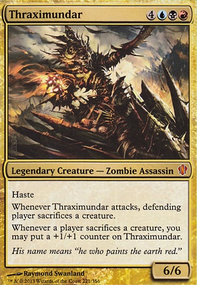 I'm not sure how you feel about the budget issue with Mikaeus, the Unhallowed , but it would be a very good addition, even before taking the combo with Walking Ballista or Triskelion into account. 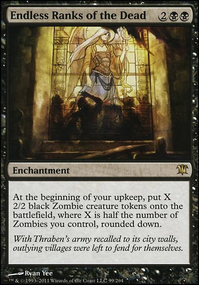 It's a solid addition to a black deck, and there are some affordable tutors that can get both pieces like Beseech the Queen , Diabolic Intent (on theme, so maybe add it regardless), Sidisi, Undead Vizier (also on theme! ), and Netherborn Phalanx . 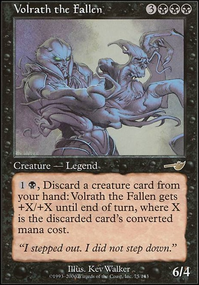 As for reanimation, Rise from the Grave is pretty inefficient, and upgrading to Animate Dead , Victimize (on theme! ), Dread Return (apparently there's a lot of sac'ing in black, who knew? ), Sepulchral Primordial (great with repeatable ETB effects), Rise of the Dark Realms (expensive, but a black staple in EDH), Necromancy , Thrilling Encore (great if you can sac with Dictate of Erebos or Grave Pact ), Ever After (one more mana for twice the value), Whisper, Blood Liturgist , Champion of Stray Souls (so much sac'ing), Hell's Caretaker (again, so much sac'ing), Ink-Eyes, Servant of Oni , Rescue from the Underworld (on-theme), Infernal Offering (sac! ), Necromantic Summons (strictly better than Rise), Zombify , and Footsteps of the Goryo (...sac). The last thing I would do is check out the EDHREC pages for Yahenni, the color black, and sacrifice to see what others are running. Good luck!